Never before have we been able to offer such a comprehensive package at such a low price! This unbeatable floor package deal which comes with absolutely everything you need to scrub, strip and clean hard surface floors. 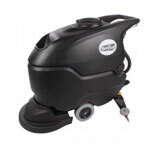 It features the rugged Performer floor scrubber for large areas,one of our most popular industrial floor scrubbers. It's perfect for hard floor commercial use and can be used from anything to cleaning hard surfaces in a retail, hospitality, healthcare, office or industrial setting with the 2 nylon brushes or 5 cases of red scrubbing pads that are included. It can also be used for removing old finish from a sealed warehouse floor with the 12 inch black stripping pads that are also included. You can use the grit impregnated stripping brushes and the four FREE cases of concentrated floor finish remover to effectively strip any sealed floor. Also included in this great combo package are one replacement front squeegee, one replacement rear scrubber squeegee, one case of industrial strength floor degreaser, and one case of liquid defoaming agent. Take a look at each specific item included in this package in the links below. Please note that the yellow wet floor signs aren't listed because we don't sell them separately at this time. Don't forget to check out the other floor scrubber package deals we offer including other great auto scrubber packages to save you more money in your floor cleaning business.